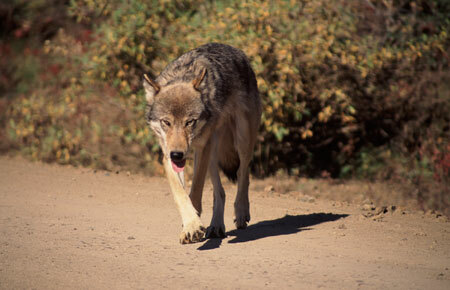 Predation by other wolves is a major cause of death for wolves because wolves defend their territories. Genetic evidence suggests that as Alaska deglaciated following the most recent glacial maximum and animals colonized the newly exposed areas, wolves from the contiguous Western United States entered Southeast Alaska, likely following the northward expansion of black-tailed deer along the coast. Wolves in Interior Alaska are likely descended from animals that inhabited Beringia during the ice age, and wolves in Southeast are genetically distinctive from "continental" wolves. Alaska is home to an estimated 7,000 to 11,000 wolves. Wolves have never been threatened or endangered in Alaska. The food habits of the wolf often bring it into conflict with humans who in many parts of the world are also hunters of big game animals. Although the wolf has coexisted with big game animals for thousands of years, under some conditions the impact of predation contributes to local scarcities of game which arouse some people's concern. In most non-coastal systems with moose and caribou, wolves and bears together maintain game populations below levels at which their food supply would be damaged. Various studies of wolf ecology have shown that the balance between wolf and prey populations can be disrupted. For example, severe winters in combination with wolf and bear predation can drastically reduce a big game population. Because many of Alaska's big game populations and their habitats are less productive than those in lower latitudes and because predators such as wolves and bears are common here, human hunters have to limit their harvest in many areas. In some areas wolf numbers may need to be controlled in order to avoid relatively long periods of prey scarcity which could result in little or no harvest for people and also low numbers of wolves and other furbearers. The Status and Outlook of Southeast Alaska's Unit 2 Wolves — 2014 (PDF 1,105 kB) is a 2014 publication highlighting recent research, population status and harvest guidelines, and management and research plans. It focuses on Unit 2, primarily Prince of Wales Island and neighboring Dall Island to the west. It is six pages in length, with one map. Status of Wolves in Southeast Alaska — 2012 (PDF 57 kB) is a nine-page overview of the coastal wolves of the Alexander Archipelago. It summarizes past and current research including population ecology, taxonomy, current management considerations and the relevance of the Tongass Land Management Plan and the Endangered Species Act. 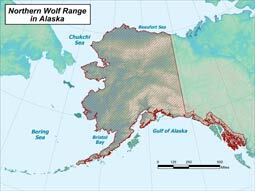 Alaska is home to an estimated 7,000 to 11,000 wolves. Wolves have never been threatened or endangered in Alaska.